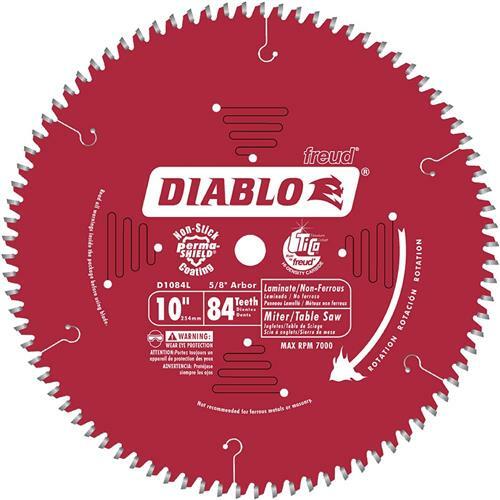 For a clean-cutting blade that makes non-abrasive cuts in coarse flooring materials and non-ferrous metals, look no further than the Freud D1084L 10-Inch Laminates, Melamines, and Non-Ferrous Metals Saw Blade. This is your go-to blade for thick flooring such as laminates and non-ferrous metals such as copper. Made to cut flawlessly, this blade's proprietary TCG (triple-chip grind) teeth leave a smooth finish with no tear-out. Special Tico Carbide formula offers a blend of carbide with low Cobalt content that produces a very "hard" carbide for long cutting life. Features Freud's Perma-Shield coating, Anti-Vibration reeds, Heat Expansion slots, and Laser Cut technologies. Thin kerf design to increase machine performance. Ideal for sliding mitre saws and underpowered table saws.